Boil pasta as directed on package and drain. Spray saute pan with nonstick cooking spray, preheat pan and add ground turkey sausage. Using a fork, break up sausage as it cooks and remove from heat when just browned. Drain. 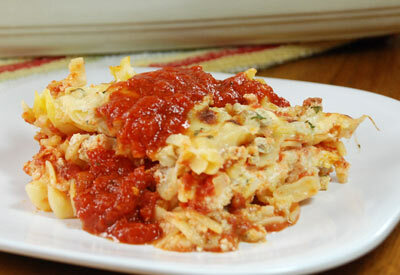 In a 13 x 9- inch baking dish add a thin layer of spaghetti sauce, half of the cooked pasta, half of the cooked sausage, dollops of ricotta cheese, half of the spaghetti sauce and slices of mozzarella cheese. Repeat procedure ending with mozzarella cheese. Pour parmesan cheese over the top and sprinkle with parsley. Bake for 25 to 30 minutes until heated through and cheese is melted and begins to brown.